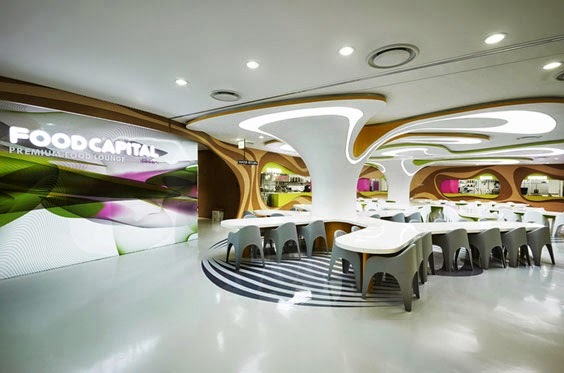 Amoje Food Capital plays on the idea of the spacial, visual landmark as a gathering place. 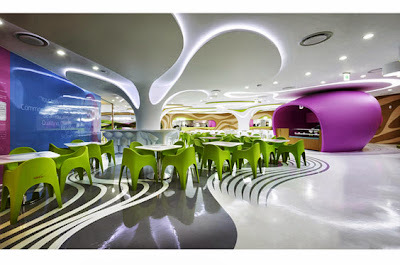 It creates a recognizable, iconic location in the space for people to gather, meet, socialize and eat in color! The organic “islands” not only infuse the space with character and contemporary aesthetic, they serve as a pivotal landmark around each column, where people meet and gather. The islands are centrifugal in arrangement, inviting users to interact, communicate and socialize in the space. This creates a lively dynamic setting which generates a sense of place for gathering and will ultimately make the space successful. The undulating perimeter of the area is perforated to create visual openings for service counters. 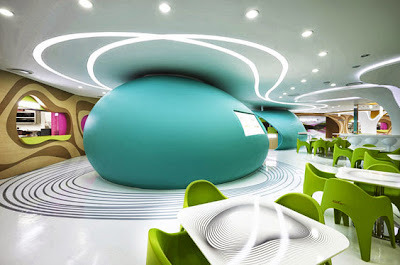 Snack locations are “carved” into the surrounding perimeter creating with strong visual highlights for the eye inside. The floor plays off the linear patterns of the perimeter wall creating a strong wireframe that creates a sense of continuous dynamism and motion within the space.